Collin Klein-QB-Kansas State (6-5 226 lbs. ): Let the Tim Tebow comparisons begin. Tough runner that is patient and finds creases in the defense. Funky pass delivery. Not a great arm. Lacks zip and puts too much air under the ball. Led East team with 35 yards rushing. Completed 5/13 for 43 yards passing. Colby Cameron-QB-Louisiana Tech (6-2 205 lbs. ): Quick runner but needs to work on timing in the passing game. Threw late on a sideline pattern which led to a pick six. Completed 3/6 for 33 yards. Had one rush for 12 yards. Nathan Stanley-QB-Southeastern Louisiana (6-5 215 lbs. ): Good size. Has a live arm and throws a nice ball. Has good pocket escapability. Very raw. Transferred from Ole Miss. Completed 2/5 for 19 yards and 1 pick. Ray Graham-RB-Pitt (5-10 190 lbs. ): Injured his knee in 2011. Has not seemed the same since the injury. Good vision. Good change of direction, but not as good as 2011. Had 23 yards on 6 carries, 1 catch for 6 yards and fumbled on the first play of the game. Returned kickoffs. Montel Harris-RB-Temple (5-9 208 lbs. ): Former Boston College player that transferred to Temple for senior season. Boston College’s all-time leading rusher. Had issues with coaches which led to the transfer. Returns kicks. Good receiver. Had 3 carries for 8 yards and 1 catch for 6 yards. Also returned punts and kickoffs. Zac Stacy-RB-Vanderbilt (5-9 214 lbs. ): Compact body type. Very powerful runner between the tackles. Draft position may depend on his 40 time at the Combine. All-time leading rusher at Vanderbilt. Trent Steelman-WR-Army (6-0 210 lbs. ): Starting QB for Army for 4 years. Only player ever to start at QB for four years at Army. First game as a receiver, so he is very raw. Dropped his only chance in the game, but he showed good hands during practices. Versatile player that also long snapped. Great leadership. Quick feet and has good potential as a slot receiver. Played QB in wildcat package and gave the team a lift, rushing 2 times for 13 yards and 1 TD. Emory Blake-WR-Auburn (6-2 195 lbs. ): Has good height, but could add a few pounds. Good routes, but not very physical. Son of former Bengals QB Jeff Blake. Corey Fuller-WR-Virginia Tech (6-3 195 lbs. ): Has good size. Shakes tackles once he makes the catch. Great speed but very raw. Former sprinter at Kansas. Had a chance to step up his senior season, but only caught 43 balls. Led the East with 2 catches for 29 yards. Rodney Smith-WR-Florida State (6-6 219 lbs. ): Great size. Long, lean build. Very raw, but coaches say he picks things up well. Needs some work on route running. Terron Armstead-OT-Arkansas Pine-Bluff (6-5 310 lbs. ): Great feet. Natural waist bender. Long arms. Perfect build for a left tackle at the next level. Devin Taylor-DE-South Carolina (6-8 267 lbs. ): Tall lanky defender. #2 all-time in tackles for loss at South Carolina. Chases sideline to sideline. Powerful bull rush and is able to push the blocker back into the backfield. Has the size to be a 3-4 defensive end. Dominated the West offensive line. Had 2 tackles for loss, 1 sack and 2 forced fumbles. Mike Catapano-DE-Princeton (6-4 270 lbs. ):Runs well. Gets his hands up. Had a batted pass. 2011 Ivy League Defensive Player of the Year. Izaan Cross-DT-Georgia Tech (6-4 300 lbs. ): Does a good job pushing the pocket. Very good at getting his hands up once the ball is released. Batted one pass. Matt Evans-LB-New Hampshire (6-0 230 lbs. ): Doesn’t have ideal size, but is always around the ball. 3 time FCS All-American and winner of the 2011 Buck Buchanan award. Caused a fumble in the game. Sio Moore-LB-UConn (6-2 229 lbs. ): Flies to the ball. Very good week of practice. Productive at UConn with 3 straight years of over 10 tackles for loss. Nick Moody-LB-Florida State (6-2 237 lbs): Former safety. Has good speed. Sheds blockers well. Good containment skills. Branden Smith-CB-Georgia (5’11 175 lbs. ): Small frame. Had mixed success. Had the jump on a sideline pass, but misjudged the ball. The ball was caught for a 57 yard touchdown. Later in the game he intercepted a ball. Rod Sweeting-CB-Georgia Tech (6-0 187 lbs. ): Breaks very well on the ball. Had one pass breakup. Cooper Taylor-S-Richmond (6-4 230 lbs. ): Very good size. Deceptive athleticism. Good hitter. Earl Wolff-S-NC State (6-0 227 lbs. ): Good in man coverage. Goes up and gets the ball at it’s highest point. Had a pick in the end zone. Seth Doege-QB-Texas Tech (6-1 205 lbs. ): Not great size. Decent arm. Needs to work on his ball location. Was 4/8 for 30 yards and 1 interception. Also had a fumble on a sack. Matt Scott-QB-Arizona (6-3 208 lbs. ): Good runner with quick feet. Inconsistent passer than needs to work on his mechanics. Completed 3/4 for 81 yards, including a 57 yard TD pass. Rushed for 5 yards. Alex Carder-QB-Wester Michigan (6-3 225 lbs. ): Most impressive quarterback in the game. Very nice 3 step drop. Delivers ball on time. Throws well on the run. Keeps his eyes downfield when scrambling. Completed 9/11 for 95 yards, but had one pick on an overthrow. Improved his draft stock. Christine Michael-RB-Texas A&M (5-11 220 lbs. ): Missed time in 2010 due to a leg injury and 2011 for ACL. Was benched in 2012. Has quick burst and explosion. Good wiggle for a guy his size. Changes direction well. Finishes the run and can spin out of tackles. Has the athletic skills to make it at the next level, but needs to put it all together. Led the West team with 13 carries for 42 yards. Had 1 catch for 7 yards. Fumbled once. Zach Line-RB-SMU (6-1 230 lbs. ): Tough inside runner. Good hands. Deceptive moves for a big man. 2012 C-USA Offensive Player of the Year. Could play fullback or running back. Reminds me of former Buccaneer Mike Alstott. Had 8 carries for 33 yards. Kerwynn Williams-RB-Utah State (5-8 191 lbs. ): Small but fast. Versatile back that had more than 2,000 all-purpose yards in 2012. Dynamic runner that slips out of tackles. Makes people miss. Understands pass protection and gives good effort. Able to return kicks. Had 28 yard rushing on 8 carries and had a 37 yard kickoff return. Anthony Amos-WR-Middle Tennessee State (6-0 185 lbs. ):Good hands. Makes the tough catches. Good concentration. Tough to bring down after the catch. Good vertical jump. Scored a TD on a reverse and had 4 catches for 59 yards. Chad Bumphis-WR-Mississippi State (5-11 198 lbs. ): Not real big, but plays bigger than his size. Good concentration. Had a 57 yard touchdown off of a tipped pass. Led the West with 4 catches for 92 yards. Jasper Collins-WR-Mount Union (5-11 190 lbs. ): Knows how to get open. Does a good job driving off the defensive back. Comes back to the QB. Had 3 catches for 17 yards. Zach Sudfeld-TE-Nevada (6-7 255 lbs. ): Huge target. Goes over the middle and catches the ball in traffic. Had 1 catch for 9 yards and dropped another pass. Tanner Hawkinson-OT-Kansas (6-5 300 lbs. ): Started at left tackle but struggled all day with Devin Taylor. Did not appear to have the quickness or strength to play on the left side. Was pushed back into the QB by Taylor on a bull rush. Jeff Baca-G-UCLA (6-3 295 lbs. ): Good drive blocker. Did a good job opening up holes in the running game. Travis Johnson-DE-San Jose State (6-2 245 lbs. ): Athletic player that makes plays all over the field. Was the WAC Defensive Player of the Year. Tied for #2 in the country with 13 sacks and had 21 ½ tackles for loss. Has the size and athleticism to convert to outside linebacker. Brandon Thurmond-DE-Arkansas Pine-Bluff (6-2 260 lbs. ): Speedy defensive end that led the FCS in sacks. Very quick first step. Hard to block one on one. Relentless in pursuit. Lacks ideal height for a defensive end, but may be able to convert to a 3-4 linebacker. A.J. Klein-LB-Iowa State (6-2 244 lbs. ): Active and very quick off the ball. Does a good job filling the hole against the run. Can play inside or outside. Albert Rosette-LB-Nevada (6-2 240 lbs. ): Plays with good leverage. Good form tackler. Terry Hawthorn-CB-Illinois (6-1 193 lbs. ): Good size. Able to cover big receivers. Plays with good inside position. Had a fumble recovery and an interception in the end zone. Aaron Hester-CB-UCLA (6-2 195 lbs. ): Good size. Plays with good position. Tends to be overly aggressive. Had two pass interference penalties despite being in the right position. Nigel Malone-CB-Kansas State (5-10 180 lbs. ): Terrific ball skills. Good man cover corner. Had a 30 yard pick six. Khalid Wooten-CB-Nevada (5-11 200 lbs. ): Good man cover corner. Stays in good position. Had an interception. Duke Williams-S-Nevada (6-0 200 lbs. ): Good covering kicks on special teams. Big hitter. Zeke Motta-S-Notre Dame (6-3 215 lbs. ): Good size. Big hitter. Plays well in the box. Recovered onside kick. 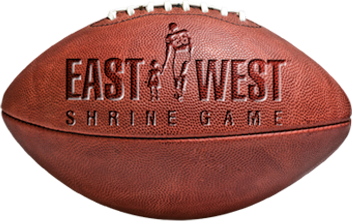 This entry was posted on January 22, 2013 by draftmaniacs in All-Star Games and Combine and tagged 2013 East-West Shrine, 2013 NFL Draft, East-West Shrine, NFL Draft.